What was happening in Bowling Green, KY on July 1, 1846 almost 170 years ago? Well, now we know! A wonderful, recent donation lets us learn more about Bowling Green’s early history. 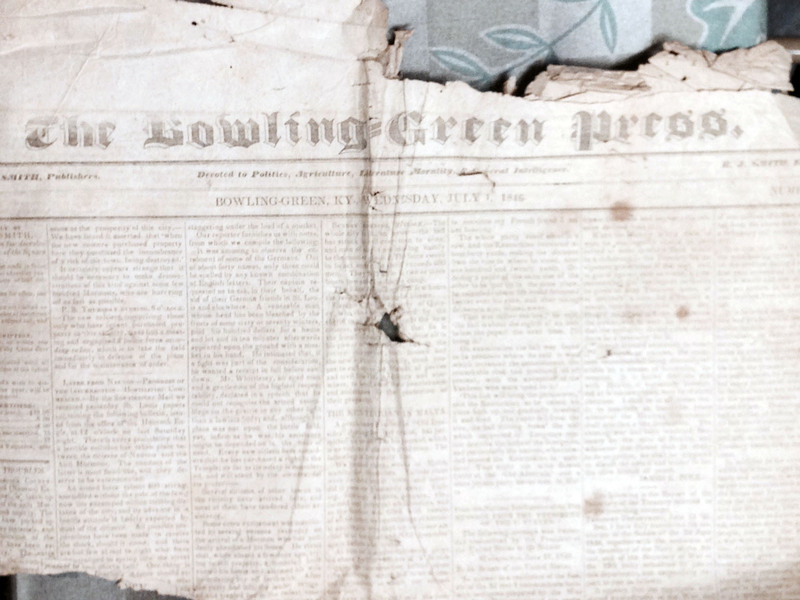 This very rare newspaper, with the masthead, The Bowling Green Press, is the only one our Special Collections Library staff have seen, and although it is in poor condition; it is definitely preferable to having no specimen at all. The survival of any periodical is a triumph against many odds. We think of our culture as a throw-away culture but newspapers have always be seen as expendable–meant to be read, passed around and then thrown away, or even used for wrapping paper or other household purposes. The newspaper noted under its masthead, that it was devoted to “Politics, Agriculture, Literature, Morality and General Intelligence.” Headlines in the issue focus on the Mormon conflict and controversy at Nauvoo, IL, President James K. Polk and his declaration of war with Mexico and the “Awful Calamity” in Quebec as the Theatre Royal burns killing 50 people. “The Theatre Royal, Saint Lewis [street], took fire from the overturning of a camphene lamp, at the close of the exhibition of Mr. Harlean’s Chemical Dioramas, and the whole interior of the building was almost instantly in a blaze. Local news highlights include the deaths of Mrs. Sarah Cox, 87 of this county and Mrs. George (Adelaide) Milliken of Simpson County, KY in her 30th year. There are a few handsomely illustrated advertisements of products or services offered and they portray many aspects of daily life. Butter was selling for 10 cents per pound, coffee at 9 cents and sugar, 7 cents. Books and “tationary” were for sale at Townsend’s store and the most “fashionable style” hats could be had at William Whiteman’s store. The Louisville Steamer packet, “General Warren,” left regularly at 10:00 every Saturday. Also, if you did not feel well, Dr. S. A. Withrs (sic) requests that you stop by the Green River Hotel or his office across the street from the Market House for treatment. 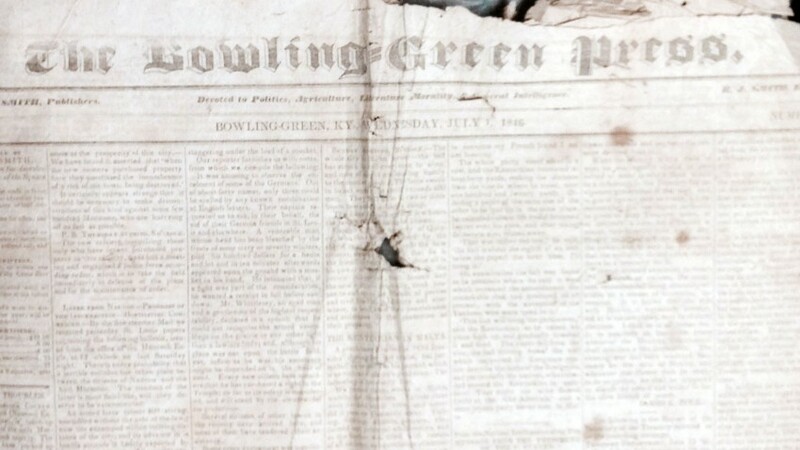 We are so pleased to have this early Bowling Green, KY newspaper and will preserve it for future historians. You may see this and other items in the WKU Department of Library Special Collections by visiting or by searching TopSCHOLAR and KenCat.